Harvard University’s W.E.B. 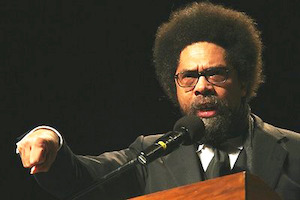 DuBois Research Institute at the Hutchins Center celebrated the return of Dr. Cornel West to Harvard’s faculty yesterday via an inaugural Spring Colloquium headlined by West titled, “The Trump Era: Hope in a Time of Escalating Despair.” In his introduction of West, Dr. Lawrence Bobo, W. E. B. Du Bois Professor of the Social Sciences at Harvard University, seemed to capture the flavor of the moment. Bobo was seemingly alluding to the circumstances surrounding West’s prior departure from Harvard for Princeton University in 2002 following a public row with then-Harvard President Lawrence Summers, who questioned the value of West’s scholarship. Bobo and his wife, Dr. Marcyliena Morgan, also left the Harvard faculty for Stanford University in 2004 after Summers denied Morgan tenure despite the unanimous recommendation of her Harvard African-American studies colleagues. Morgan and Bobo returned to Harvard’s faculty in 2008 with Morgan’s tenure in hand. “Seventeen years ago, an evil thing happened on this campus, to Cornel West,” said Dr. Henry Louis Gates Jr., Alphonse Fletcher University Professor and director of the Hutchins Center for African and African American Research at Harvard. West campaigned for Democratic presidential primary contender Sen. Bernie Sanders, before campaigning for Green Party presidential candidate Jill Stein in the general election. West’s lecture also had a spiritual bent. West used some colorful examples of what he considered “gangster,” adding, “I’m not trying to engage in some kind of denigration of the public discourse because I’m putting myself on the same continuum. I got gangster proclivities, too. On the other hand, Gates mentioned as a prelude to a question to West that Trump seems to have a very close relationship with his children, belying a public perception for bullying. For a recording of the live stream of the Spring Colloquium event headlined by West, who holds a distinguished joint faculty appointment in Harvard’s W.E.B. Du Bois Department of Afro-American Studies and the Harvard Divinity School, visit https://livestream.com/accounts/7639591/events/6897539.